Hi loves, welcome back to my blog! 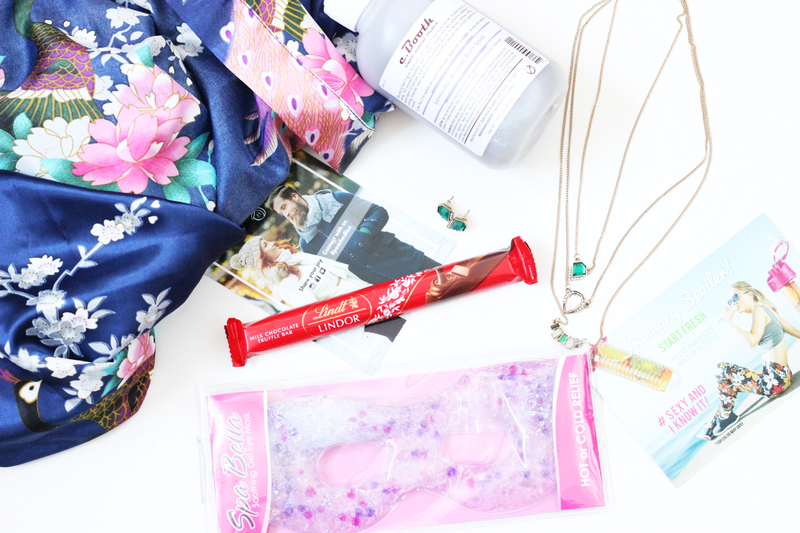 Today I have a fun post on a subscription box! 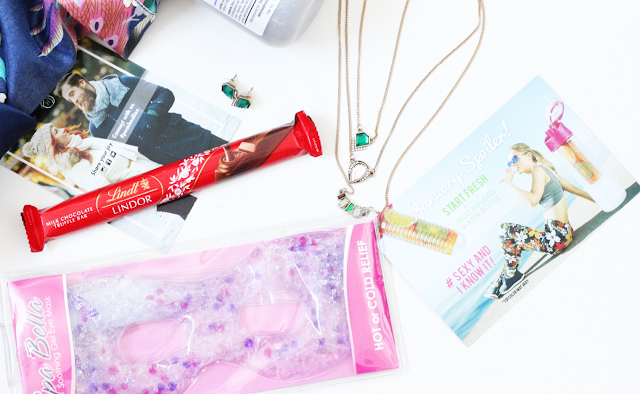 This is the Peaches and Petals subscription box, which has a mix of life style products. Today I will be sharing what was included in the December box! And with the December box it is all about treating your self. Also, right now you can get the February box for only $19.99, or you can also use coupon code "PEACHSWATCHES" to get 50% off your first month! Kimono Style Silk Peacock Robe- I am seriously in love with this robe. It is so beautiful and has such a wonderful pattern. I feel so elegant wearing it around my house. Lindt Milk Chocolate Truffle Bar- honestly who could go wrong with chocolate? I am in love with Lindt chocolate and I just had to share this bar with my niece. C. Booth Lavender Mineral Bath Soak- I am such a sucker for taking baths, and I love lavender scent. Emerald Necklace & Earring Jewelry Set- The necklace is seriously so pretty. It is like a 3 in 1 necklace and I love the emerald green shade. I think its a great piece to wear with a basic top and it just adds something a little extra to a look. Spa Bella Hot or Cold Rejuvenating Eye Mask- The spa mask was perfect to wear during a bath to help relax even more. I honestly loved everything that was included in this December box. One thing I really liked is that it came with a variety of products. It was a perfect box to help relax after a long days of work. I loved the added jewelry and chocolate as well. If you are looking for a different subscription box to subscribe to I would totally check this one out! It is so different then any other box and you get so many full size items! I think it is well worth it! This box was sent to me for review purposes but all opinions are my own. Wow, a robe??? And a mask and chocolate? WIN! Gonna check this one out!